William Moorcroft (1872-1945), an art school graduate and the son of a Burslem china painter and designer, was first employed in 1897 as a designer for the commercial pottery and porcelain firm of James Macintyre & Co.
As a reaction to mass production, 'art pottery' enjoyed wide popularity at the end of the 19th century. Names like Carter (Poole), Pilkingtons (Salford), Linthorpe (Middlesborough), William De Morgan (London) and Ruskin (Smethwick) all emerged in this period. Among the most successful and enduring was the Moorcroft pottery in Cobridge, Staffordshire. 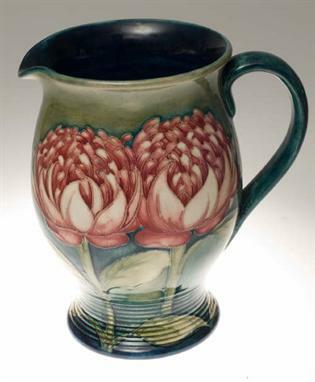 William Moorcroft (1872-1945), an art school graduate and the son of a Burslem china painter and designer, was first employed in 1897 as a 24-year-old designer for the commercial pottery and porcelain firm of James Macintyre & Co. Unusual forms in otherwise commonly encountered patterns will command a premium. This silver mounted clock in the big poppy or anemone pattern, 6in (15cm) high, sold for £5800 at Tennants of Leyburn in November 2010. Within a year he was in charge of the company's ornamental ware department and, by 1904, the Art Nouveau-influenced Florian Ware that perfected the technique of trailing slip known as tube-lining had won him a gold medal at the St Louis International Exhibition. It was this level of success, and Moorcroft's desire to personally oversee production, which ultimately saw him open a pottery of his own in 1912 on Sandbach Road, Cobridge backed by the famous London store Liberty & Co. Since 1962, when the Moorcroft family bought out Liberty, the pottery has had a chequered ownership history but has continued to produce wares in the distinctive tube-lined style. Sally Tuffin (now of Dennis Chinaworks) produced designs for Moorcroft between 1986 and 1992 while in 1993, 24-year-old Rachel Bishop joined Moorcroft as only its fourth designer in almost a century. 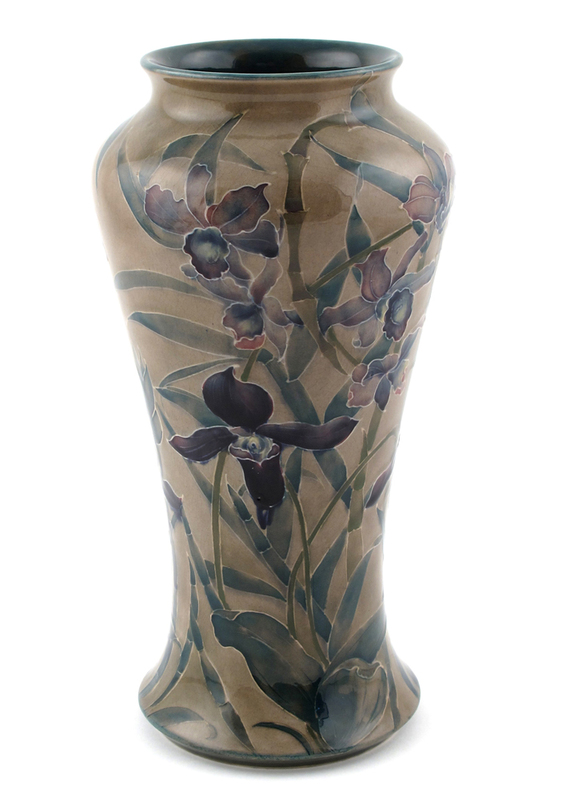 In 1998 a new Moorcroft Design Studio was established and employed several designers to extend the range of products. Early in his employment at Macintyre's, William Moorcroft created designs for the company's Aurelian Ware (transfer-printed wares enamelled in red, blue and gold) followed soon afterwards by Florian Ware that combined Art Nouveau and Arts and Crafts forms and natural motifs with the technique known as tube-lining that has been used in almost all of Moorcroft's art pottery ever since. Among the Macintyre ranges were Poppy (1898), the Hazeldene landscapes with trees (1902), Claremont with its toadstool motif (1903), Tudor Rose (1904) and the largely monochromatic Flamminian Ware showing Moorcroft's growing interest in the use of lustre glazes. Much of the output was sold through Liberty & Co. in London and Tiffany in New York. Pomegranate (1910), Spanish of the same year and Pansy (1911), along with Wisteria (1910), all showed a subtle change of direction, while landscapes like Moonlight Blue (1922), Eventide (1923) and Dawn (1926) won acclaim at the Paris Exhibition of 1925 for wares reflecting the style of the Art Deco period. 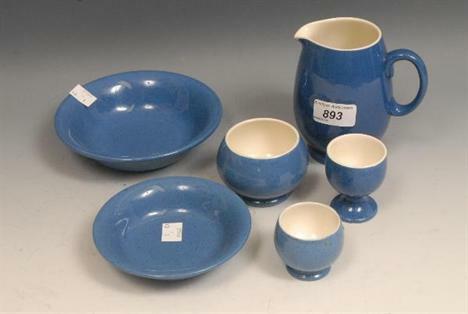 Alongside these, the factory also produced an extensive array of moderately-priced blue-glazed domestic tableware. The Powder Blue range, made in largely traditional shapes from 1913 until 1963, was used in Liberty's subterranean cafe. 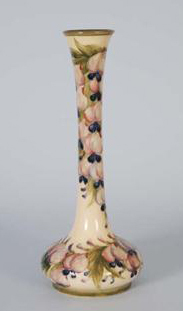 As some patterns enjoyed long cross-period production runs, dating Moorcroft can be difficult. The seasoned eye can date a piece by design, glaze and technique of manufacture but the wide variety of impressed and printed marks and (if they survive) factory paper labels, used across more than a century of production do make the task much easier. The literature is particularly good on these but the best pieces are signed. With the advent of the Florian range in 1903, William Moorcroft took responsibility for all aspects of production and firing and almost every piece carried his hand-painted signature. In 1935 William Moorcroft's son, Walter Moorcroft (1917-2002) joined the firm and introduced many of his own styles and designs into the catalogue after he took the reins of the company in 1945. Most of the big flower patterns such as Hibiscus, Anemone, Magnolia, Lilies and Columbine are from the Walter Moorcroft period of vivid floral designs. But slowly the market diminished and although Walter Moorcroft continued to design into the 1990s (his last, Rock of Ages, was launched in 1999), the Moorcroft family sold most of their shares in 1984. 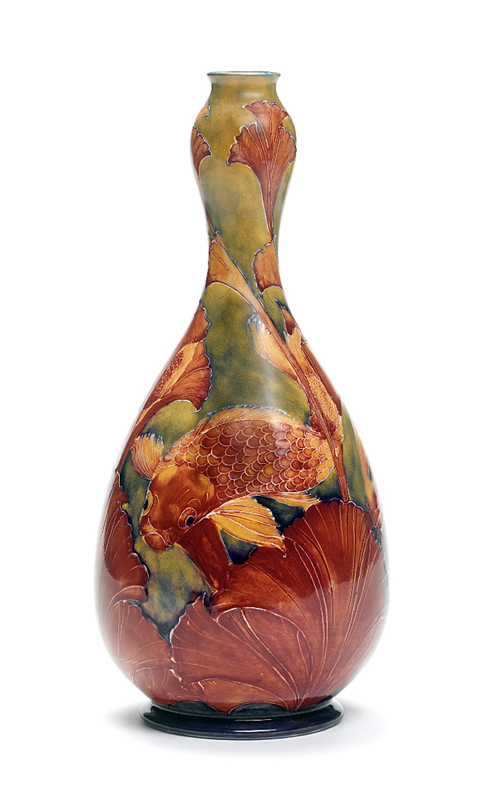 The new impetus provided by dealer/author Richard Dennis and Sally Tuffin in the 1980s, when inventive designs influenced by wares from the founding days of William Moorcroft were coupled with the advances in colouring techniques, has continued into the current era. 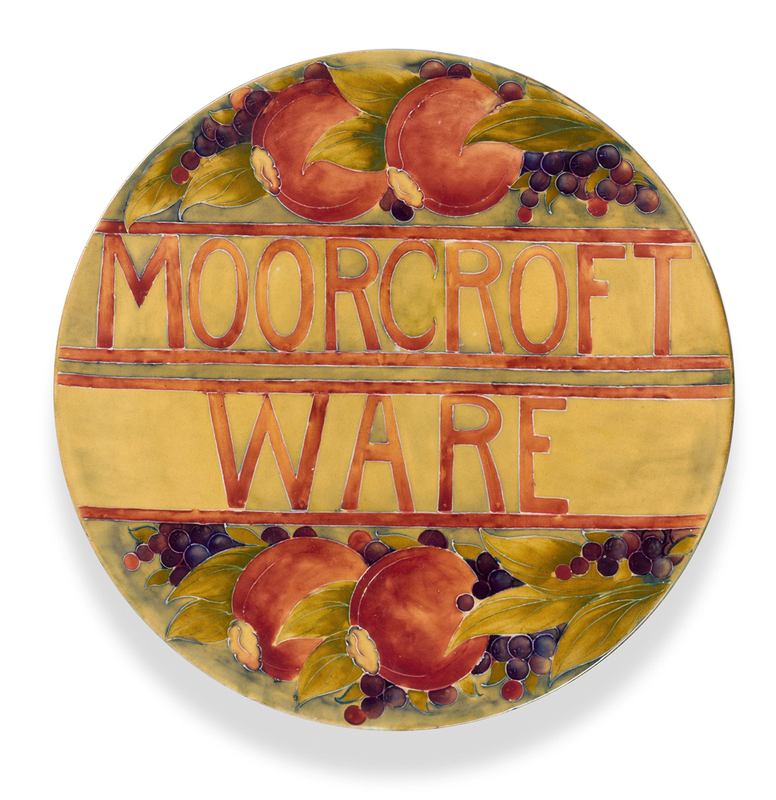 Today the company boasts that Moorcroft is selling more of its wares than it did in its heyday of the mid-1920s. While auction prices fluctuate, Moorcroft remains enormously popular with a broad range of buyers from the English-speaking nations and beyond. Prices for Moorcroft begin at £20 for a piece of Powder Blue or a post-War pin tray and climb to the five-figure sums paid at auction for the largest pieces from the Florian range. Generally, while recently-made pieces are widely collected, and some of the modern limited edition pieces or those from the Sally Tuffin era can bring substantial sums, it is the Walter and particularly the William Moorcroft signed and designed pieces which are most sought after. These are distinguished by date, pattern, shape, size, ground colours and by glaze type. Pieces with condition issues will also meet a more measured response. Early patterns in the Art Nouveau/Arts and Crafts taste are typically the most highly regarded, the later Walter Moorcroft designs generally less so. 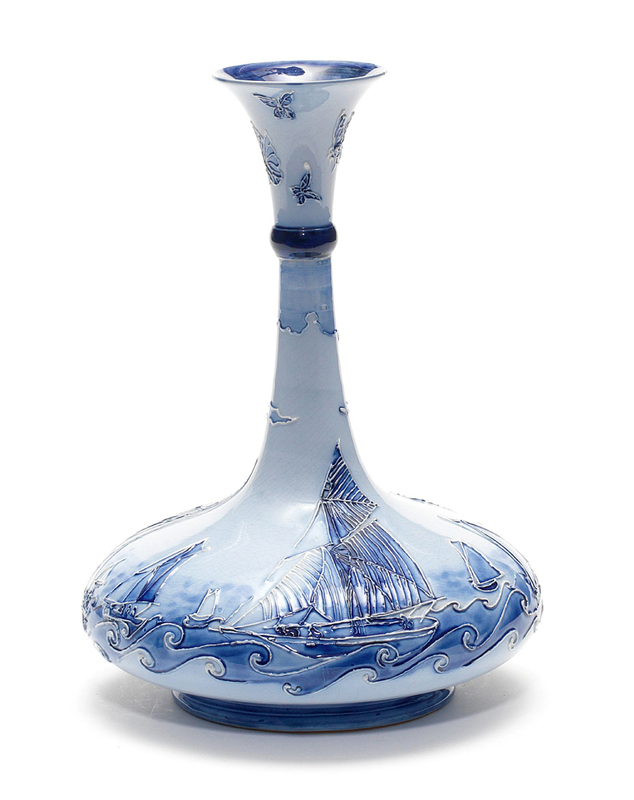 At the top of the pile are rarities such as the Yacht vase sold by Bonhams in 2010 as part of the Wright collection for £10,000, a lustre Carp vase sold for £16,000 at Bonhams in 2009, or the Bamboo and Orchids vase sold for £10,000 at Woolley & Wallis of Salisbury in November 2011. 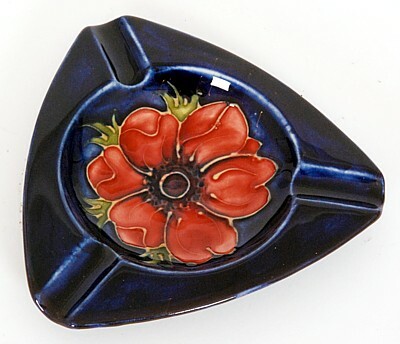 Both father and son also experimented with high-temperature flambé glazes for which a special kiln was built in 1921 and these lustrous wares are currently hugely popular, while advertising wares or patterns made exclusively for export - such as Waratah decorated with the state flower of New South Wales - are desirable rarities. The ranges applied with period metalware, such as those with silver or pewter mounts by Liberty & Co. of London, or the all-over silver decoration applied in America for sale in stores such as Tiffany in New York, also command a premium. Miniatures, produced in most patterns, are a collecting field of their own: some tiny rarities from the Macintyre era can command sums similar to those for full-size versions.